POSAME Classic Stand Mixer Tilt-Head 6-Speed Kitchen Electric Food Machine--Your best friend for kitchen! Posame stand mixer was designed to make all kinds of food for your family like egg whites, bread dough,mixed salad. Convenient and professional, free your hands. -Rotary mechanical switch with 6-speed: You can control your recipe more precisely. Whether you're stirring wet and dry ingredients together, kneading bread dough or whipping cream. -Head Tilt Settings: You can change different accessories for different need with the head up. This innovative Tilt-back head function, you can easily access the mixture, add ingredients efficiently. -Removable 5-Qt stainless steel bowl: Gives you enough capacity to prepare your dishes.And it is dish-washer safety. -Y-shape Flat Beater Help you thoroughly mashing potatoes, mixing cake batter and cookie dough in a easy way. -Stainless steel whisk: Provides you fluffy whipped cream in seconds for your boiled frostings and cakes. Posame stand mixer is ETL and FDA approved, safety for kitchen use, we also provide 1 year manufacturer warranty. 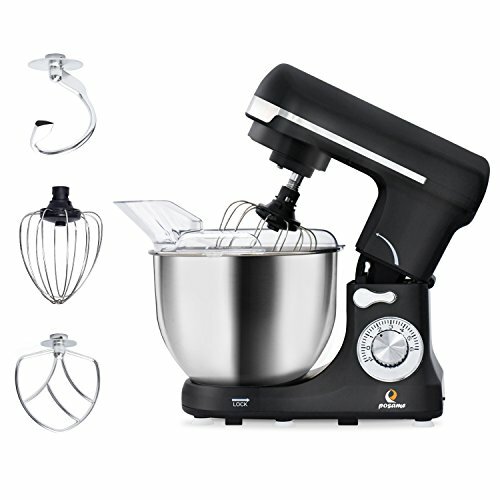 【POWERFUL MOTOR & VARIABLE SPEED CONTROL】500W High-performance motor stand mixer and 6-speed adjustable control,provides you versatility to make different food at different speed with easy to operate mechanical switch. 【LARGE CAPACITY BOWL & EMBEDDED LID】5 Qt. removable stainless steel bowl with embedded lid offers sufficient capacity to mix dough and other food.Convenient to add ingredients without splash and mess. 【MULTIFUNCTIONAL ACCESSORIES】This professional food mixer is equipped with C-shape dough hook, Y-shape mixing blade and stainless steel whisk, give you versatility to beat, whip,knead, mix eggs or cream, making bread,cakes,salad. 【MODERN DESIGN & STABLE STRUCTURE】Black appearance with stainless steel decoration,elegant and stylish design for classic kitchen mixer. Dual guide structure device decreased vibration while working. 【TILT-HEAD & ANTI-SLIP DESIGN】 Tilt-head design of the household mixer provides an easy access for accessories to the bowl to mix and the Anti-slip detail confirms the stability of the working mix machine. If you have any questions about this product by POSAME, contact us by completing and submitting the form below. If you are looking for a specif part number, please include it with your message.